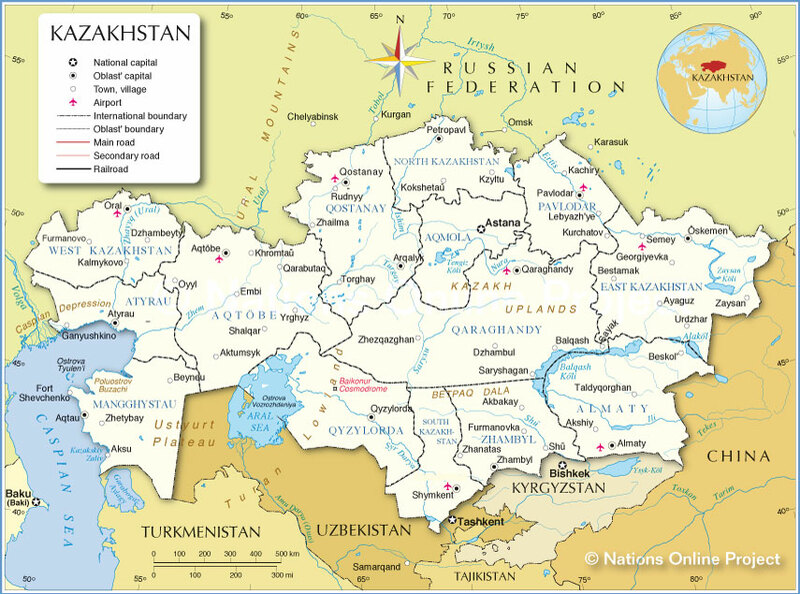 Territories: Administratively Kazakhstan is comprised of 14 oblasts (regions) and 3 cities (qala, singular - qalasy); Almaty, Almaty, Aqmola (Astana), Aqtobe, Astana*, Atyrau, Batys Qazaqstan (Oral), Bayqongyr, Mangghystau (Aqtau; formerly Shevchenko), Ongtustik Qazaqstan (Shymkent), Pavlodar, Qaraghandy, Qostanay, Qyzylorda, Shyghys Qazaqstan (Oskemen; formerly Ust'-Kamenogorsk), Soltustik Qazaqstan (Petropavl), Zhambyl (Taraz; formerly Dzhambul), 84 cities, 160 rayons, 10 municipal districts, 195 settlements, 2,150 auls (rural counties) as of 5.05.97. 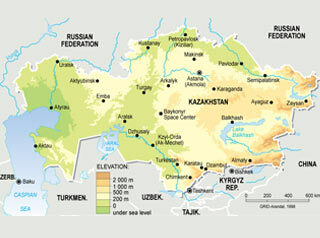 Geography: The Republic of Kazakhstan lies right in between Europe and Asia, between 45° and 87° of East longitude, 40° and 55° of North latitude. Kazakhstan represents the geographical centre of the European and Asian subcontinent (the crossing of the 78 meridian with 50 parallels in the epicentre of the former Semipalatinsk atomic proving ground. 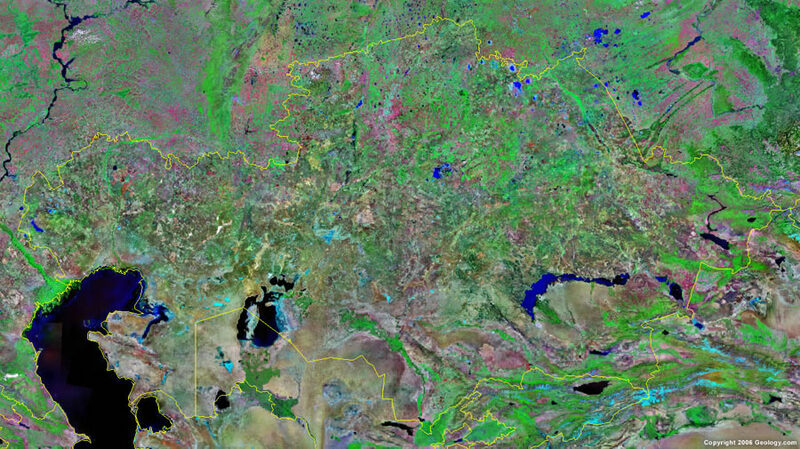 It occupies a vast area of 2724,9 thousand square, it stretches from the east of the Caspian Sea and Volga plains to the mountanious Altay and from the foothills of Tien Shan in the south and south-east to the West-Siberian lowland in the north. The extent of the territory from the west to the east is more than 3000 km and from the south to the north is 1700 km. 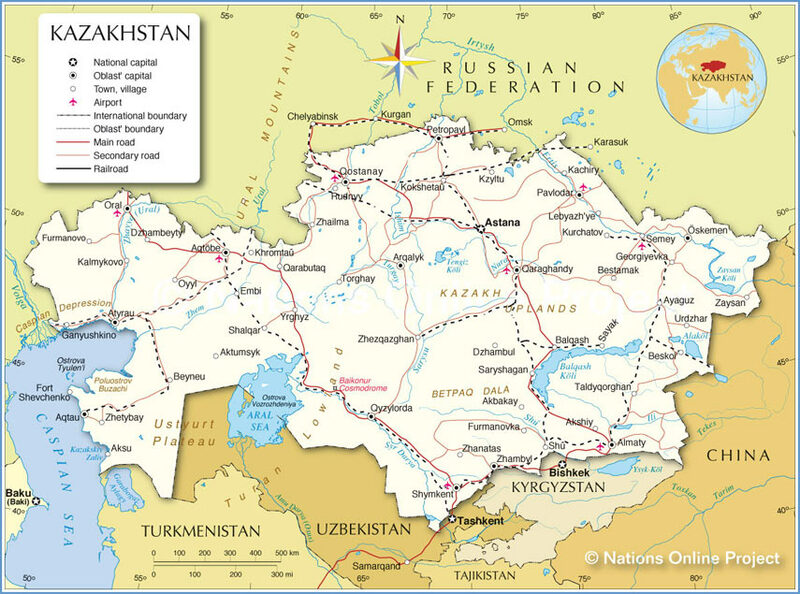 The total extent of Kazakhstan borders is nearly 12,2 thousand kilometres, including 600 kilometres along the Caspian Sea in the west. Landlocked. Borders the Aral Sea (1,015 km) and the Caspian Sea (1,894 km). 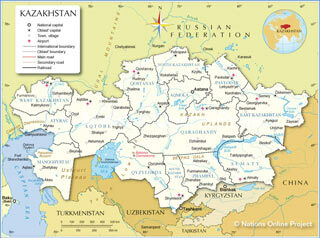 Kazakhstan is famous for its uncalculated mineral wealth. 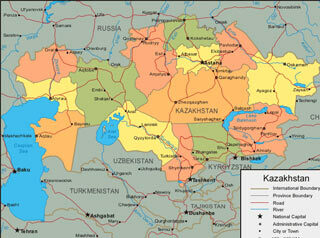 The scientists of the leading countries consider Kazakhstan to be on the six place in world. 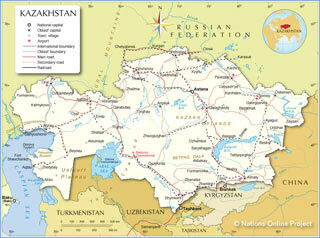 Kazakhstan has enormous rich natural resources. In short, 99 elements among 110 elements of the Mendeleev periodic system are found in the depths of Kazakhstan. 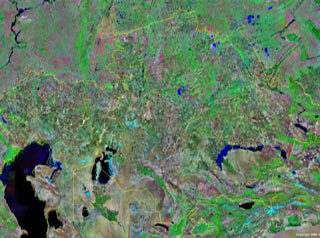 There are 14 perspective basins on the territory of Kazakhstan. Only 160 deposits of gas and oil with the turnings of 2,7 mid, tons are investigated now. Kazahstan have rich natural resources: major deposits of petroleum, natural gas, coal, iron ore, manganese, chrome ore, nickel, cobalt, copper, molybdenum, lead, zinc, bauxite, gold, uranium and etc. In huge territory of Kazakhstan there is a number highly of seismically active zones, strong earthquakes was in the south and around Almaty. Climate: continental with cold winters and hot summers. Arid and semiarid. 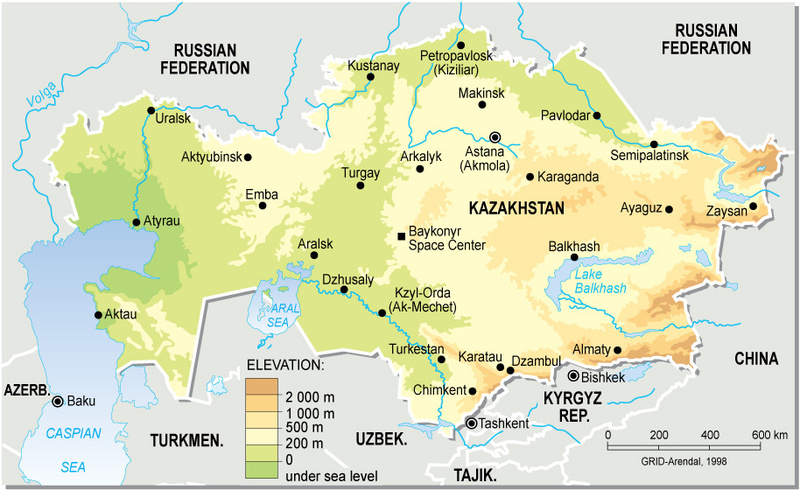 Situated between two quite different natural and climatic zones (Central Asia and Siberia), Kazakhstan is the region where the cold air masses from the north meet with the hot winds from the south. That is why Kazakhstan has the sharp continental climate. It is characterized by irregular distributions of precipitation in its different areas. In separate years spring stretches from the south to the north during 1,5 - 2 months (when it is spring sowing in the south, the north area is covered with snow and the blizzards storm frequently). Crossing the territory of Kazakhstan from north to south one can get into different climatic zones, so as various areas with its own flora and fauna. The desert of Kazakhstan is the arid area. The climate of that area is characterized by the extreme rare rains and high temperature in summer, severe and intensely cold weather in winter. There are often winds which cause sandy storms. The air is extremely dry and the temperature in summer is sharply varies even during twenty-four hours. Major industries: Oil, coal, iron ore, manganese, chromite, lead, zinc, copper, titanium, bauxite, gold, silver, phosphates, sulfur, iron and steel, nonferrous metal, tractors and other agricultural machinery, electric motors, construction materials, grain (mostly spring wheat), cotton, wool, livestock. National Flag of the Republic of Kazakhstan is a a piece of right-angled cloth of sky-blue colour with a picture of a golden sun with its 32 rays in the centre, under them - a soaring steppe eagle. Flagstaff has vertical line with national ornament.The picture of sun, its rays, eagle and ornament are of golden colour. Width/length ratio of the flag is 1:2.